A fast, fluent version of the outdoor game, played in the nets, both single and double, to keep the ball alive. No wet weather cancellations as games are played indoors and out of the hot Queensland sun. Competitions are graded to suit the beginner through to the representative player. 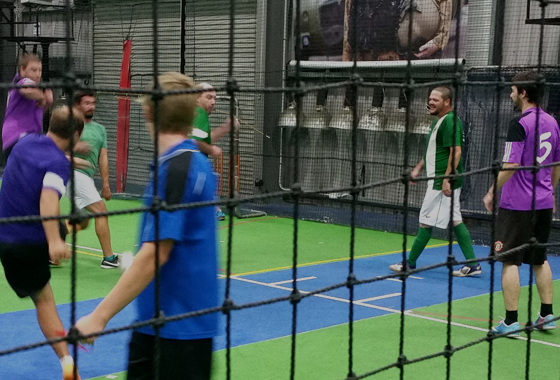 We have three seasons per year, with opportunities for men’s team, mixed grade and junior soccer competitions. Teams are graded on the overall strength of the team; not the individual players. Our Summer Competition will commence from September 27, 2019. 'WATCH THIS SPACE' as we are presently in discussion with Football Queensland to introduce Futsal to formalise our Indoor Football Program to a uniformed structure which also allows for player / team opportunities to play higher level competitions such as the Futsal SEQ League (Inter Centre Competition), State Titles, National Titles and National Club Championships. All our games are played on DOUBLE COURTS - twice the width so you can show off your passing & crossing skills & tactics. So much opportunity here ... and never miss a game through bad weather!! We have a very active junior session running on Friday afternoons. Depending on their abilities, Juniors are offered skills development before moving into a friendly competition. This is a popular activity but simply come down on Friday afternoon to enrol and join in. See our separate Junior Sports page for more information about Junior Soccer. Registration fee includes insurance and must be paid by Week 3.